Westfield Football Club looks like being without leading scorer David Pugh for the rest of the season. The 17-goal striker tore tendons and ligaments in his shoulder during the 2-1 defeat away to Rustington on Saturday and hospital staff have advised 10-12 weeks’ rest. Pugh’s injury made it a double whammy of disappointment for Westfield after losing the Macron Store Sussex County Football League Division Two game to a goal midway through five minutes of added time. Westfield weren’t really in the match at all during a lethargic first half performance. Rustington enjoyed the majority of the possession and took the lead midway through the half when Steve Gettings was given too much room to control a long ball into the box, cut inside a defender and fire into the bottom corner. Although Westfield were off the pace, they might have reached half time on level terms had Ashley Paine’s shot following a Sam Henham free kick not been cleared off the line. Westfield bucked their ideas up in the second period and equalised soon after the restart when Tom Archer snuck in at the far post to head home Sam Willett’s free kick from the right. Westfield were really pressing for the opening 25 minutes of the second half. A terrific Willett free kick was kept out by an equally good save and a penalty appeal was turned down when Pugh sustained his injury. 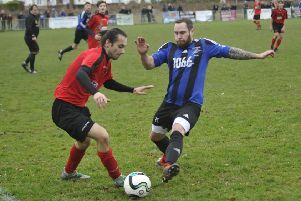 The visitors lost their way during a scrappy final 15 minutes and Rustington nicked it late on. A long ball over the top wasn’t dealt with and Josie Stakim skipped round goalkeeper Connor Holland before slotting home. Westfield: Holland; Paine, Henham, Archer, Bell; Willett, Dadswell, Cuddington, Ringwood; Pugh (Seymour), J. Booth (Kendall). Sub not used: Drinkwater.